It is said well behaved women seldom make history. Further proving that statement was a group of suffragettes who planned a commotion for the textbooks. 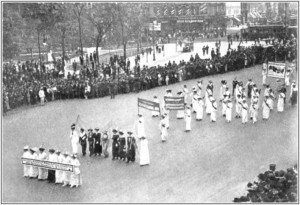 This year marks the centennial anniversary of the women’s march in Washington, D.C. It was held one day before President Woodrow Wilson’s inauguration in 1913. Much like the traditional Presidential parade, the women marched from Capitol Hill to the Treasury Department. But instead of celebrating the election’s winner, they wanted to draw attention to their exclusion from the process. Many of the male spectators disrupted the procession by shoving, and taunting the women. Some police even joined in. The event was just one of many during a decades long battle for women’s right to vote. They finally won that right in 1920. Since then women have taken huge strides in politics. And that is also true of women who cover politics. Veteran White House reporter Helen Thomas began her career in a male-dominated political environment. The 92 year old didn’t think she would ever see so many women in leadership positions. “I think we made great progress. Maybe not enough totally, but (it’s) a very big improvement. There’s no question about that,” Thomas said. Massachusetts Senator Elizabeth Warren is part of the next generation of women creating history. She is one of twenty female Senators who now hold a seat in Congress. “It’s long past when women should be in positions of leadership, and I am glad to be there to support my sisters. I am glad to be there to make sure that we make some real changes as a country,” she said. Senator Warren says she is making women’s equality a top priority. Her agenda includes fighting to level a twenty cent pay discrepancy between men and women in the Bay State.